Large, rustic, & luxurious are words seldom used together, but accurately describes Spirit Dancer Lodge. A luxurious, energizing, rejuvenating, and romantic get-away far removed from the stresses of city life. We're on 60 private acres in the Blue Ridge Mountains of the Shenandoah Valley. Upon your arrival, you will receive four free wine tastings at a nearby winery. We offer 4000 square feet of living space with queen beds in two of the four, spacious bedrooms with a soaking tub and shower in the master bedroom and two twins in the other bedroom on the main floor. A large, closed-in loft area has four twin beds. All rooms have large windows to let the outside in. The great room has a huge stone fireplace, dining room and kitchen, all open together and has floor to ceiling windows with prowl front and Brazilian cherry hardwood floors. The deck includes a grill and an outdoor fire pit great for smores and dinner! Downstairs, you'll find our sauna room (5 person) with queen-size futon, 18 foot stone bar, game room, 62 inch TV and a smaller bedroom with a trundle bed and additional futon for more guests comfort. The interior house is specially designed in southwest decor. We're located in Etlan, VA, just off Virginia's Route 231, one of America's ten most outstanding scenic byways (Great for biking!). We back up to Shenandoah National Park & Old Rag Mountain, which offer numerous scenic hiking trails. We have a stocked pond for 'catch & release' only, however, there's recreational trout fishing nearby on the Rose, Hughes and Rapidan Rivers. Visit many, outstanding wineries, cheese factories, historic sites, civil war battlefields, Luray caverns, historic Monticello and the lovely town of Charlottesville. Antique shop, bike, hike or just sit back and enjoy the beautiful scenery and numerous wildlife. Our dining room table seats 16 comfortably and makes for memorable, candlelight celebrations. The Lodge is ideal for family gatherings, corporate retreats, reunions, birthdays, girls/guys weekends or a romantic getaway. There are many scheduled events, festivals, and activities throughout the year. There are world class to down-home restaurants within 10-30 miles (Most notable, Inn of Little Washington). So come and relax. You won't want to leave. Amenities: huge stone fireplace, phone, air conditioning, 62' TV plus three standard size TV's, VCR, DVD, large video library, clock radios in each bedroom, stereo, CD, dvd player, VHS player, full-gourmet kitchen, microwave, dishwasher, refrigerator, cooking utensils provided, linens provided, iron & ironing board, washer, dryer, sauna, 18' bar, gas BBQ grill, den with daybed and futon, game room with air hockey, mountaintop gazebo & outside fireplace. *****Hard line for local calls only (540 area code or 911/emergency phone calls). Phone card needed for other calls, though incoming calls are allowed. bed sheets, pillows, comforters and provided. Feel free to bring your own pillow or blanket if it makes you more comfortable. Traditional coffee maker. Starter filters provided. We will provide all pots and pans, baking and cooking accessories. Renters are required to bring ALL ingredients and spices required to make meals. Table extends on both ends. Can seat 16. Corn hole, chess, checkers, game boards, etc. Many VHS and old movies to watch! This Lodge is not handicap accessible due to grade on driveway and many stairs. Overall this house was absolutely lovely and Darden was super responsive and helpful. The only real issue was that there was no phone service in the area (and the landline at the property did not work). It would have been nice to have head a heads up about how dead the area was, with directions to important places (the hospital, gas station, the vineyard that the coupon was for). Luckily the neighboring property had guests who let us get their WiFi password, so we were able to stand in their driveway to get directions to places. We also couldn’t get the hot tub to work, though not entirely sure if that was user error or not. Overall, we had an amazing time getting off the grid, but just had minor snafus getting help with locating places. We as a family rented the Spirit Dancer and it’s sister lodge the Sun Dancer for a few days and nights after Christmas. We really enjoyed the setting and the houses and views!! Also the owners and Darden were very easy to work with! However the Spirit Dancer was definitely the older lodge and not as well stocked with kitchen needs and also not even 2 star clean! Also not enough bath linens for occupancy of 12. We really wanted to love these lodges so we could recommend to friends etc but now don’t really feel that we can do that. We are sorry! 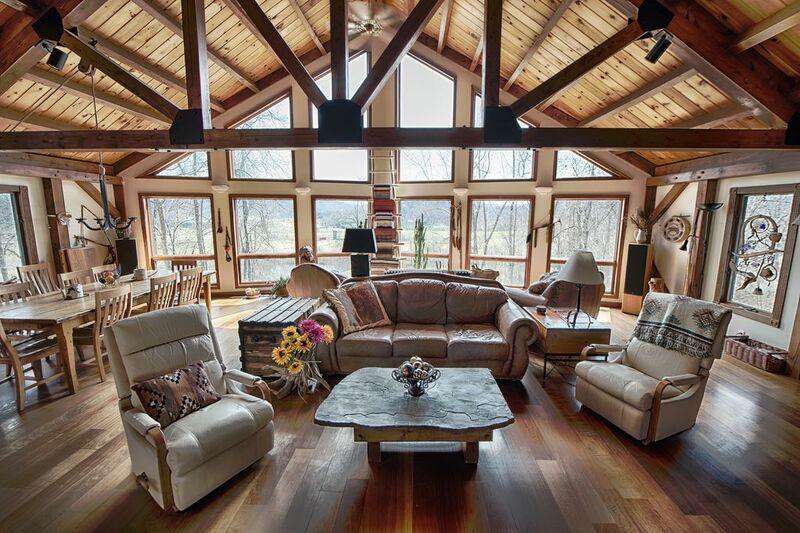 This home is perfect for a quiet getaway, even more perfect if you plan to hike Old Rag! The home is gorgeous and comfortable. The property is so very peaceful! Thank you so much for your lovely review. We sure are happy you enjoyed the Lodge and hope to see you again soon! My 8 friends and I loved our weekend at the Spirit Dancer cabin. The cabin itself was spacious and offered great amenities. My friends and made great use of the outdoor deck with hot tub, indoor fireplace, large kitchen and dining area, and big TV. The cabin also includes a sauna and outdoor chiminea-type fireplace that we didn't get a chance to use. The cabin is very close to the Old Rag and White Oak Canyon trail heads. Both are great hikes! FYI - the cabin doesn't have WIFI and most of us did not have cell service, but the cabin has a phone for incoming calls and a method for making emergency outgoing calls. I personally loved the opportunity to disconnect. Rented Spirit Dancer for a long weekend of hiking in SNP. There were 14 adults and while the house had sleeping arrangements for that many people, we needed more linens. Property is beautiful with spectacular views, nice hiking around the property, close proximity to SNP and we saw a bear daily as we looked out the front window. There are also many things to do in the area in addition to hiking. The kitchen and dining area easily accommodated our large group with enough dishes, silverware, pots & pans, etc... The oven only had 1 rack ( not the customary 2) so that was a bit of a problem, but we managed. The hot tub was wonderful after a long day of hiking. Nice entertainment options with a large screen TV downstairs and stereo/ CD player upstairs. Darden provides clear instructions on how to operate them as well. Not real happy that we needed to wash, dry and fold all the linens prior to our departure or pay a $150 laundry fee as most rentals I have used before do the laundry for you and that is included in the fees. I'd rate it 3.5 stars given that and the needed upgrades. Thank you for the kind words! We are delighted you enjoyed our Lodge and we can't wait to host you again! Wineries, Golf , Hiking and Rock Climbing, Caverns, Biking, State Parks and Shenandoah National park, Fishing, Wildlife Viewing, Horseback Riding, Shopping, Restaurants, Sightseeing, Rafting, Canoeing the Shenandoah River, Antiquing, Historic sites & Civil war battlefields, Cheese factories, geocaching & paintball, Charlottesville, Monticello, many scheduled Festivals and Fair, Dutch Market with playground and petting zoo. In Lodge, there is a large game room with dart board, air hockey table, fusball and many games & puzzles. Ski: Massanutten Ski Area 45 min. away. We are located 90 minutes from DC and 35 minutes from Charlottesville. We are sad to report we no longer have a hot tub on the property. If this changes, we will update our site appropriately. Note: Until confirmed, rates are subject to change without notice.